Blog posts tagged "jake hopkins"
Rawnola® is the brain child of raw food chef and expert Jake Hopkins. Boy are we glad he took the time to craft these this tasty product line. Seriously have you tried any of these amazing products?They are all very tasty, light, crunchy and easy to digest. Jake Hopkins is a fellow desert dweller and good friend of Zebra Organics. His Goji Bar was our very first product, so as you can tell we have a fondness for him and his creations. What I absolutely love about his creations is their taste and texture. If you have yet to try just one then you should pick up a bar on your next order. They are light and crunchy, which is a wonderful combination, they are sweet but not too sweet and they digest well. If you find texture satisfying then you will delight in all the Rawnola® products. And, the subtle blending of spices is perfect, not overbearing and easy to enjoy. Unlike most raw cereals and products out there Rawnola® does not contain any buckwheat. Sprouted buckwheat I find hard to digest, it has a somewhat abrasive quality on the stomach. Where as the raw sprouted almonds are light almost flaky, this makes for a nice bite and good body. 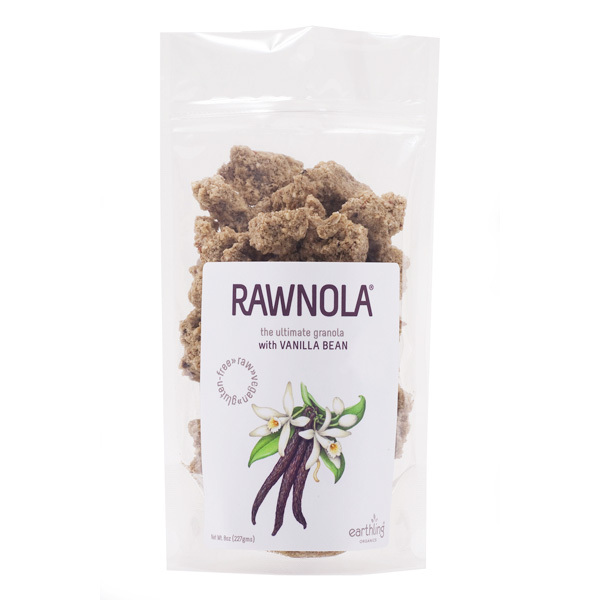 Raw Cacao Rawnola® I can almost guarantee you will love these cereals. If you ever were a fan of chocolate cereal as a kid, then you are in store for a treat my friend. 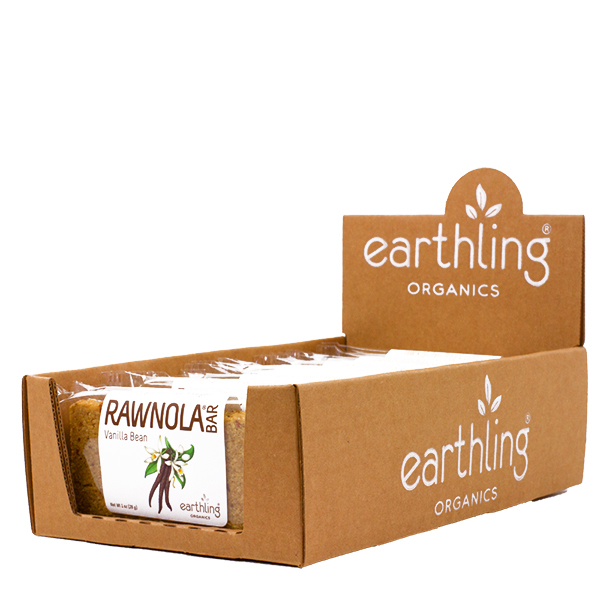 The Heirloom Cacao Rawnola® is hands down the very best Raw chocolate cereal on the market. This may sound biased but its true. This is our business we should know and we stand behind the quality of the products we offer. And if chocolate is not your thing then try Vanilla Rawnola® an equally delicious variety of Rawnola®. Chocolate: If you want the full health benefits of chocolate try our Heirloom Cacao Rawnola Bars. Made with an Arriba Criollo Variety of Heirloom Cacao grown indigenous to Cacao's origin. Grown at small scale farms in the mountainous regions of Ecuador. The raw cacao beans are hand cultivated and harvested, then sun dried to maintain nutrient density. By Earthling Organics® - An unbaked snack, soaked and low temperature dried. organic by BioGrow of New Zealand), *Cinnamon, *Vanilla Bean (whole). soaked and low temperature dried. Chef Jake's version of a Granola bar. the new Lemon flavor of this Raw, Organic Bar Gluten Free • Organic • Raw Enhanced with traditional Ayurvedic nutraceuticals such as, Turmeric root, Ashwagandha and Shilajit. *Coconut, *Almonds, *Pumpkin Seeds, *Figs,*Real Raw Agave Nectar, Turmeric, Sun-Dried Sea Salt, Lemon, Ashwagandha, Shilajit. (*organic) Can't decide which to try want to try them all? We suggest you do as they are extremely delicious nutritious and perfect for snacking on. Purchase both the original Vanilla Bean Rawnola Cereal® and the newer Cacao Rawnola Cereal®. Healthy, Tasty Food - Gluten Free • Raw • VeganAll Earthling Organics ® products are and low glycemic, as well as grain, gluten and GMO free and the same goes for the facility. Fluffy Golden Nuggets kissed by the sun. This Original Almond Vanilla Bean recipe is a great way to start your day the lively way, from Earthling Organics. Nestled amongst fresh berries and drizzled with nut milk for a breakfast of bliss, or nibbled straight from the bag, this unbaked Granola satisfies the crunchy munchies alive-style. Looking for an alternative to starchy grains riddled with fungus and mold, hydrogenated oils, and insulin producing sugars all cooked at high temperatures? If so, our unbaked, nut and seed based Rawnola ® is sure to tantalize your taste-buds. Made of soaked Almonds and Pumpkin seeds and sweetened with raw Agave Nectar, Rawnola® is naturally gluten free and low glycemic! If you like our original almond-vanilla Rawnola Breakfast Cereal you want to experience the full health benefits of chocolate in this delectable Heirloom Cacao Rawnola ® Breakfast Cereal. This Arriba Criollo Variety of Heirloom Cacao is nature’s truest expression of chocolate. Grown indigenous to Cacao's true origin at small scale farms in remote mountainous regions of Ecuador, our cacao beans are hand cultivated and harvested like they have been for centuries past. Raw cacao beans are sun dried to retain the full integrity and bioavailability of the mineral and nutritional profile absent from typical roasted cacao. Jake Hopkins the founder and alchemist at Earthling Organics has been supplying the raw food world with his tasty "Goji Bar" since I can remember . . . lets just say for at least the past 8 years! Thank you Chef Jake for your scrumptious service! The Goji Bar is a real treat, it is crunchy and yielding, sweet and savory, enticing and satisfying. Oh and it has goji berries, so there is just enough chew wrapped up in all of it. It is also a gluten free, grain free and low glycemic snack option. The Goji bar is made with Soaked Almonds, coconut, goji berries, figs, raw agave nectar a touch of sea salt, cinnamon and vanilla. They are such a popular item at Zebra Organics and they don't really need too much extra promotion. But we are always attracting new customers and they may not know just how good these unassuming bars are. And, with so much awareness about and interest in tasty gluten free options, I just had to remind everyone that these bars are available. By now you might be interested in trying some, to top it off they are made by hand and certified organic! *Catch the Goji Berry Sale This Month: Use Coupon Code el20goji at checkout. *Purchase $25 or more and receive 20% off an 8 ounce package of Essential Living Foods organic goji berries. Your savings of 20% are on top of the sale price of $11.11, you pay $8.89. Our very dear friend Chef Jacob Hopkins has been delighting taste buds for years. Purchase Chef Jake's Earthling Organics organic food bars and breakfast cereal. Jake’s Unbaked began to take hold after Jake produced a recipe which he called the “Goji Bar.” The Goji Bar idea struck him when he returned to his car one hot summer's day to find his goji berries had warmed up and were sticking to some nuts. He tested his “Goji Bar” recipe on friends and was promptly encouraged to keep on making them... a whole new health bar was born. Jake gave a bar to David Wolfe who said, “Make as many of these as you can!”, and so began Jake’s Unbaked, grown from a desire and passion for the finest, most nutritious foods that nature brings. Jacob has worked with many celebrities and health seekers alike, developing a well-known and trusted reputation as a leader in the world of Raw/Live foods. Jake is a sweet spirit and we just love him! Zebra Organics is proud to make available to you Chef Jake's organic food bars; Goji Bars, Rawnola Bars, Yogi Bars, Matcha Bars, and the new Rawnola Breakfast Cereal... to learn more or purchase these organic, healthy bars or cereal visit the Zebra Organics store!